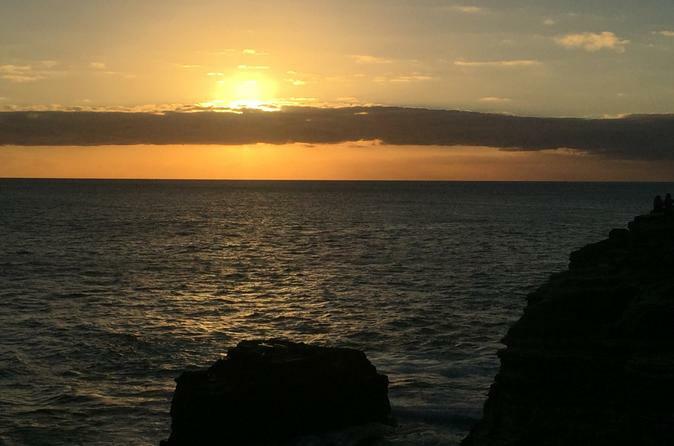 Enjoy beautiful beaches & a breathtaking sunset on this 3 hour small group tour. Escape the rush of Waikiki and head to Oahu's east side, where some of the island's nicest beaches are tucked in the rocky coast. Leave sandy footprints at Sandy Beach, see the rated #1 Beach in the U.S. from Makapu'u Lookout and see the Halona Blowhole.During season we do a little whale watching before watching the sun set behind Diamond Head. This small group tour is a personalized experience, and throughout the tour you'll learn the area's enchanting history and culture. Start times are differ form winter to summer. Please call us to schedule the pick up time! Your 3-hour tour begins at your Waikiki hotel when you are picked up. Leave the rush of the city behind and escape to the eastern shore, where you'll get to see beaches like Waimanalo— rated the #1 beach in America. This is a small group tour with max 7 guests and you will have a personalized experience with stops that are catered to your group. While driving the coast in an air-conditioned luxury van, we stop at Makapu'u Lookout to scan the horizon for whales during winter or watch the waves at Sandy Beach during a powerful summer swell. You will see the Halona Blowhole and the famous Eternity Beach from the Movie "From here to Eternity" and "50 first Dates". Throughout the entire sunset tour, your local guide will tell you the legends and history behind this coastline, including tales of the epic battle that was fought at the Pali Lookout, before driving back into Waikiki for a drop-off around 7pm. The tour start time depends on the season (summer/winter). Please call us to schedule the exact start time of your tour.